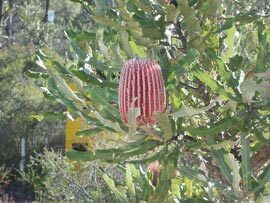 Banksia Grandis grows as either a large shrub or a small tree depending on its location, either on the coastal plains or as an understory tree in the eucalyptus forests. Although it’s the size of the seed pod that makes it attractive to artists, the name probably refers to the tree’s large leaf size. Banksias in general occur as plants ranging from prostrate shrubs, to larger bushes, and trees of around 50 feet in height. 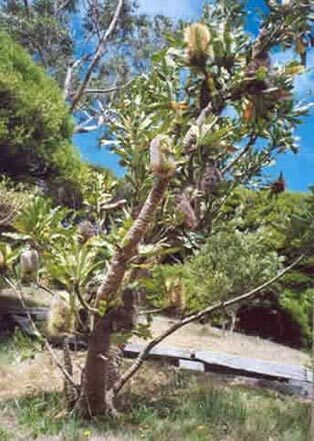 The Banksias Grandis is restricted to a natural occurrence in only the southwest corner of Western Australia. Banksia is a genus of plants that occur in Australia and Papua New Guinea numbering 75 named species. Of these, 61 are found in Western Australia, including the Banksia Grandis, the species that generates the large seed pods. The Banksia take their name from Sir Joseph Banks, the botanist who was on Captain Cook’s ship “Endeavour” that arrived in Australia in 1770. It was from a subsequent trip to Australia that specimens were gathered resulting in seeds being grown in European glasshouses and 2 new species being named. One of these was the Banksia Grandis named by Carl Wildenow in 1798. 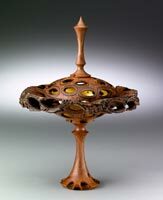 The cones commonly used for woodturning are the fruit body remains from the flower head spike that blooms from October to January. These cones can be from 4 to 16 inches long. Once the stunning, upright, golden yellow or red flowers fall off, the cone matures on the tree and the seeds develop. 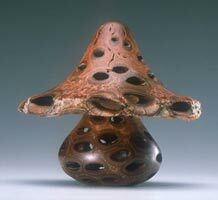 Often it is the heat of a forest fire that causes theseed case holes, which give these pods their unique appearance, to burst open and release their seeds. 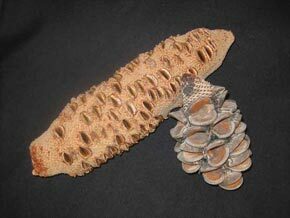 Banksia Seed Pods are a truly renuable resource, since no trees are cut down to harvest the Pods. Working with Banksia Pods is an adventure, but the results are well worth the effort!